where A is the propellant molecule (e.g., Xe or H2), and M is a generic third body (i.e., any species present). The role of M is that of an energy sink. Without M, a collision between electrons and ions accelerated by the Coulomb force and already possessing kinetic energy would typically cause them to rebound. Recombination would not occur. Only when there is a partner M to the collision between e~ and A + can excess kinetic energy be transferred to M, and these may stably bond forming the neutral species A. According to the law of mass action, the rate of recombination between e" and A + is proportional to the product of the concentrations of the three reactants (e", A+, and M), thus to their partial pressures: the recombination rate, in other words, depends on the cube of pressure. High pressure means fast recombination, thus low ionization and less propellant accelerated (lower thrust). Indeed, this is the weak point of all electric thrusters: low pressure/density means a large thruster volume per unit flowrate of propellant. The thrust per unit area is orders of magnitude lower than in chemical rockets. For instance, going from the Rocketdyne F-1 engine of Saturn V to a commercial ion engine, the thrust density at the nozzle exit reduces by a factor of 105, and so does approximately thrust [Auweter-Kurtz and Kurtz, 2008]. A second consequence of their low thrust is that EP- or NEP-powered missions must be performed "at continuous thrust for enough time''. With chemical rockets, the DV needed by a mission is achieved by a short acceleration (of the order of minutes) at high thrust. The result is a Hohmann orbit, whereby the spacecraft coasts on an inertial trajectory to the final destination. Since with EP the thrust is inherently lower than in chemical propulsion, to obtain the same D V the thrust must be continuous, for months and even years. Thus, thruster lifetime and long-term reliability are probably the most important issues in NEP. 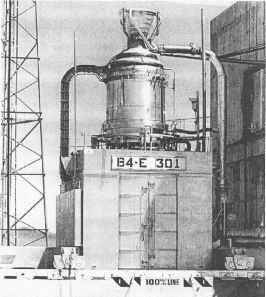 What follows is a synthetic description of NEP concepts; all assume the nuclear reactor is just a source of thermal power, to be coupled to an electric generator feeding electricity to a device that produces thrust, as anticipated in Section 7.4. There is little conceptual difference between conventional satellite electric propulsion (invariably powered by solar cells) and nuclear electric propulsion, except in the scale of power available. Comprehensive reviews of high power NEP engines are in [Auweter-Kurtz and Kurtz, 2003, 2005, 2008; Fearn, 2004, 2005, 2008].